After this story attracted a lot of attention today, HMV has issued a clarification and apology to Eurogamer.net, confirming that this false information was only shown in one store. It's apparent this was just one particular store being a little over-enthusiastic — and the poster has been removed. If it's caused anyone any issues then we're sorry, but I'd say it doesn't take much to work out this doesn't represent the company's retail offer for this release. A somewhat cheeky apology if ever we've seen one — though it's arguably a fair point — and HMV has apparently brushed off some consumer complaints about false advertising as 'over the top'. One of Nintendo's big tasks in the coming weeks and months is to convince gamers, and those yet to sample the delights of 3DS, that they really want the XL model. We all know about the various benefits, but those that unrealistically expected Nintendo to change the design and add a second Circle Pad will be disappointed: unless they happen to go to the right retailer, that is. The image in this article was snapped from a single HMV store, apparently in Cardiff, and shows an advertisement for pre-orders that is so factually incorrect that it was probably put together by someone who doesn't even know about these things called video games. Apparently the stylus is still telescopic but bigger, the two available colours are Vulcano Red and Ivory White, and the improved battery will play for up to 10 hours in 3D — it's improved, but not by that much. Oh, and it apparently has a second Circle Pad that's 'ideal for left-handed players'. It seems that this is a one-off store issue, rather than nationwide, and clearly someone read the first inaccurate report they could find and took the first image that flashed on their screen. This is actually a mock-up of an original model from a while ago, with the coloured Circle Pads actually giving away the fact that this is an image from before the system even hit stores in March 2011. We trust that the store will have fixed this by now, but unknowing pre-order customers may be surprised if they arrive on 28th July expecting a shiny new Vulcano Red system. There will be angry customers. And jobs lost. Just saying. @iroxyorsox If we didn't see it, that's just the way it goes. This image and story has popped up in the last few days, as far as I can see, and as the article said the actual mock-up that the store used is very, very old (if that's what you meant). Can't HMV be sued for doing this,for wrongly advertising it? Advertisement should be checked and controlled before put out to the public, they can get sued for false advertising. I mean, they got exactly everything wrong. This is both hilarious and sad at the same time. Stunning , visionary people working there. 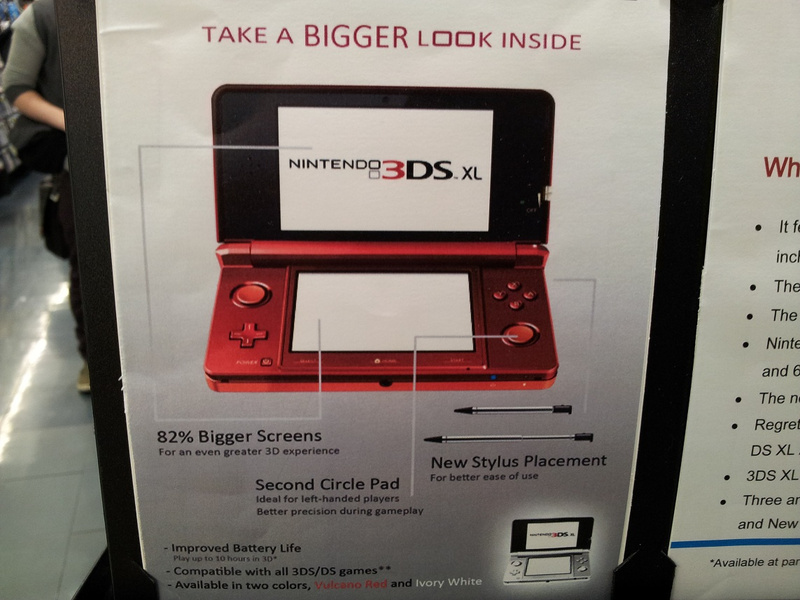 That's next year's 3DSXLPro! Yeah, falsely advertising the product and taking pre-orders for it, that's dodgy business right there. 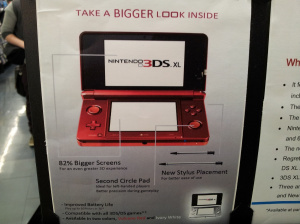 The 3DS XL doesn't even look anything like that, all glossy and bevelled. This what THEY want the 3DS to be, not what Nintendo is selling. It's not if this is true: "shows an advertisement for pre-orders"
With L2 and R2 buttons, a better placement of the second CP and this much battery life it would be hard to resist though. Old or not, this is hilarious. lol! This is priceless. Hope the employee learned his/her lesson. I don't understand people that come here just to announce they've seen this story before. This site is my Nintendo news source, I haven't seen it before, It's new too me. That picture was made from the collective dreams of the Nintendo fan base. The funniest part for me is the circle pads are the ones that were on the 3DS from E3 2010 not the circle pads that we all know & love today. I still don't think a second circle pad is all that necessary & for them to include both L1, R1, L2 & R2 buttons as well would just make the 3DS far too thick. People find it easy to say the 3DS XL needs a 2nd circle pad but they forget the CCP comes with extra buttons too that would need to be put on if the CCP ever got intergrated into the 3DS. Well that & plus 5 games use it? Meh. Stylus based control instead of a right circle pad is more responsive, quicker etc. imo so I'm happy with that. Some people just make me go, "Why do you think this?" Lol, @ second circle pad being ideal for left handed players. @19Robb92 Yeah, it's impressive how big they screwed up. Funny, but sad. Man if that was true I would so be on it. The only thing is it kinda looks odd with the one circle pad above the cross pad and the other below the abxy buttons. @iroxyorsox: What do you want some kinda of prize? Ahh, classic case of false advertisement. Can we say lawsuit? @UnseatingKDawg: idk how it would work in the UK (since this happened there), but since you and I are both in the US, i can safely say that, had it happened in the US, so long as the store in question makes all reasonable attempts to make the customer whole again after the mistaken advertisement was made (since they wouldn't be able to provide the item in question, they'd need to refund them their preorder money of course, and if these people traveled a long distance to get to that one store to make their preorder in hopes of getting a dual-circle-padded 3DS they could offer to refund them their transportation fees and whatnot), any 'false advertisement' lawsuit against the store probably wouldn't hold up in court. if it was an honest mistake and you've done everything in your power to make up to the customer for it, what more can you do? I see another company free falling. All this does for me is make me realize how ugly the 3DS would look with 2 Circle Pads. There's room for a second Circle Pad! Get on it Nintendo!! The Circle Pads should be inline as they are on the Wii U and Circle Pad Pro. Nintendo just didn't want to put the money into reconfiguring the 3DS. Lol, those retailers make sooo many misstakes! They probably have never heard about Nintendo.com, where you can find the truth! Instead they make up their own stuff! At least they are creative! Well its not true, but they did a better job than the real thing. Nintendo should hire them to design the next 3ds version. It's OVIOUS that if there ever is a dual circle pad 3ds, the circle pads will both be on top. Why does everyone say it would be unferneeth the A,B,X,Y buttons?